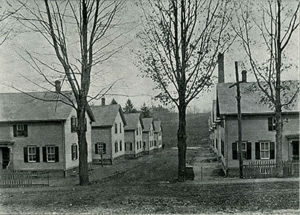 Construction of the school in Mapleville began in 1897 and was completed in 1898. It had the same design as the Bridgeton School which was also built in 1897. 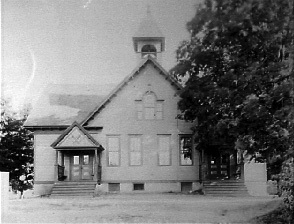 The Mapleville School was supposed to serve the community for 50 years but by 1902 the population was expanding so rapidly that additional classrooms were needed. 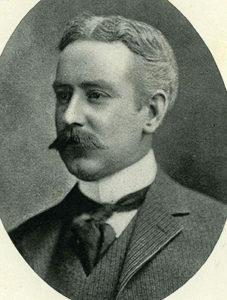 In January 1901, the Coronet Worsted Company in Mapleville was established with Joseph E. Fletcher as president and general manager. They produced fine worsted suitings for men’s wear. Mill #1 building was remodeled and a new mill building was built. This new booming business required many workers. 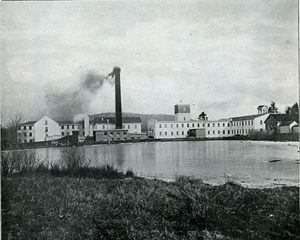 As mill operatives moved in to work in the newly constructed mill, new tenements were built to house them. The school became so crowded that many children were going to school half-time, one group attending in the morning and another in the afternoon. To accommodate more students, the two-room schoolhouse was remodeled into a 4-room building by raising the roof on the east side of the building and adding two more rooms upstairs. That is why the old schoolhouse in Mapleville has a complete second floor and the Bridgeton School does not. The schoolhouse in Mapleville is now apartments.